I would like to take this opportunity to talk a little bit about the queuing policy that Cha-ology currently has. This is a photo taken by a friend of J and I one afternoon outside of Cha-ology - the time was around 14:30, and we were serving everyone who had already sat down as well as one big group for take away items. One of the main features that I strive very hard to provide is a calm and peaceful atmosphere which is very rare in a busy city. I understand why people enjoy quick service and a more chatty and relaxed atmosphere, but this is not my aim for the tea house - there are plenty of great places like this in central Manchester. Some people feel I am heartless to make people wait and queue outside, particularly when Manchester's infamous bad weather comes around. Please try to imagine if half or even one third of the people in this queue were waiting inside; it would be very disturbing for my customers that had already sat down and also very hard for me to concentrate when preparing and explain about the tea. This is something that happened frequently in Cha-ology's early life, with 10-20 people waiting inside, talking, walking around, taking photos, looking at what I was doing, looking at what other customers were eating. 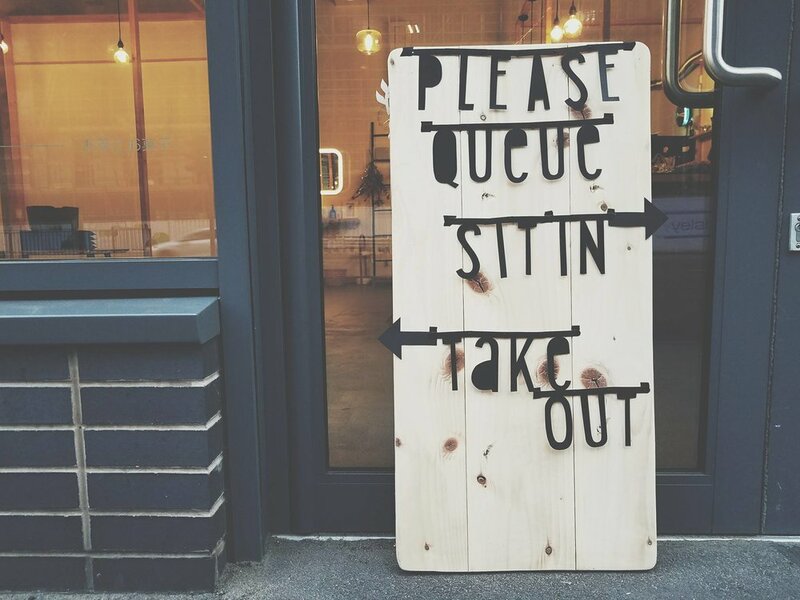 It made for a very unpleasant experience for myself and the seated customers, so I made the decision to have the waiting outside for both take away and sit in. In order to make it more visible and organised, the queue for sit in and take out has been separated. In the past it had happened many times that customers bypassed the queue and it might make people who were already in the queue feeling unfair or unsure of what was happening. I hope this signage will make a better indication of the current queuing policy. Please also be aware that the main focus for this tea house is sit in and hence the sit in custoers will be served first before any take out orders. Thank you for your understanding and patience. Some days the queue can be long and waiting time can be long. Throughout the year, I have received a lot of suggestions about table reservations. So I have recently started table reservations for Fridays and Saturdays. If you plan to visit in the future, perhaps try using this service, or maybe arrive a bit before opening time as queuing times cannot be guaranteed. If you have had the opportunity to sit in, I hope you have enjoyed the experience and atmosphere that I am fighting very hard to achieve. I hope this will provide a better understanding as to why things are done the way they are at the moment.